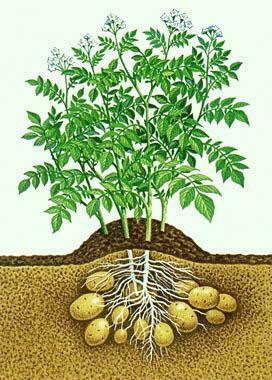 Potato - a plant of the family Solanaceae. The tubers are used as food and for food and technical purposes. In food industry the potato is a raw material for production of starch, molasses, alcohol, etc. Average chemical composition of edible parts of potatoes: water - 76,4%, carbohydrates - 20,0%, proteins is approximately 2.0%, cellulose - 0,6%, ash - 1,0%; calorie - about 90 kcal. The potato is one of the additional sources of vitamin C in the diet. The average rate of consumption of potatoes, 300 g / day in the autumn-winter period is met about half of the daily requirement for this vitamin. The content of vitamin C depends on potato varieties, retention and autumn is 26-42 mg%, and in spring - from 12 to 8 mg%. Storage and cooking reduces the amount of vitamin C in potatoes on the average on 50%. When calculating the nutritional value of potatoes should be taken into account that waste is about 25% of its weight. The absorption of potatoes quite high. Eating sprouts and green potatoes can cause poisoning generated in the process of germination-glucoside solanine. Symptoms of poisoning: tsarapaya-bitter taste in the mouth, irritation of the mucous membranes of the oral cavity, gravity in the stomach, nausea, vomiting. To prevent poisoning before use of such a potato in food it is not only clear of a peel, but carefully remove the base sprouts, where the bulk of solanine. To avoid greening and sprouting of potatoes, it should be stored in a dark place. Optimum temperature for the storage of potatoes 1,0-3,0 C; relative humidity 85-90%. Before putting it into storage potatoes should be dried and bust. Dried potatoes - concentrate fresh product, the nutritional value is not inferior fresh, but it significantly reduced levels of vitamin C.